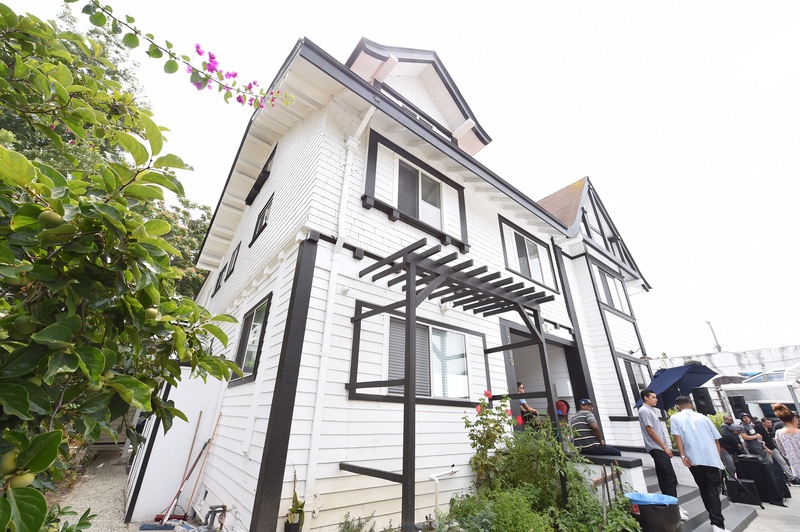 A newly opened supportive housing project in the heart of Koreatown offers men exiting the criminal justice system a real chance at turning their lives around. Far too often, people coming out of jail face an uphill battle finding a job, a place to live, or both. With the Anti-Recidivism Coalition’s (ARC) Magnolia Housing Program, 22 men who recently emerged from the Division of Juvenile Justice or prison now have keys to their new home, as well as an opportunity to receive job training with guaranteed apprenticeships in the building and construction trades. “We look forward to bright futures for each tenant entering these doors,” he added. One resident is already enrolled in the Metro Rail Mechanics program at Los Angeles Trade Technical College. Another just joined the plumbers union and is working full time. All of the current residents are working and 85 percent are enrolled in school. Founded in 2013, ARC provides a supportive network and reentry services to formerly incarcerated individuals, and advocates for fair and just policies in the juvenile and criminal justice systems. 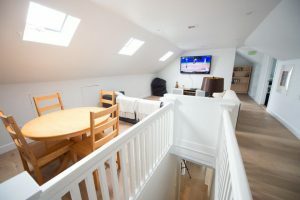 The Magnolia Housing Program is modeled after ARC’s Bromont Housing Program, which saw 76 percent of its participants employed after their second year of residence, and a recidivism rate of only 6 percent. 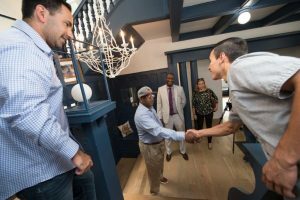 At Magnolia, 22 men will live in a newly renovated house, with mentorship on-site. Los Angeles Trade Technical College and the LA County Federation of Labor created a first-of-its-kind training program that will help them secure lasting career opportunities. Other members of the collaborative include the LA County Probation Department and the LA/Orange Counties Building and Construction Trades Council. In addition to supporting the Magnolia Housing Program, Los Angeles County is committed to doing more to help provide second chances to those who have already paid their debt to society. Chairman Ridley-Thomas, in collaboration with Supervisor Hilda Solis, plans to present a motion July 11 to establish a comprehensive Fair Chance Ordinance. If passed, it will create an outreach campaign and enhance training and curriculum for populations that have been excluded from the workforce, including those with felony convictions. Vowing to address what he called the “defining civil rights issue of our time,” Supervisor Mark Ridley-Thomas ventured into Skid Row on the final night of the 2016 Greater Los Angeles Homeless Count to help estimate the number of people living on the streets or in temporary shelters. During this year’s Count, more than 7,500 volunteers canvassed almost 2,000 census tracts spanning about 95 percent of Los Angeles County over two nights and a day. Conducted by the Los Angeles County Homeless Services Authority (LAHSA), it is the most exhaustive survey of the local homeless population – second only to the US Census in size and scope. The Count provides an estimate of the number of people staying in emergency shelters and transitional housing, as well as those living in places not meant for human habitation, such as vehicles, parks, sidewalks and abandoned buildings. The data is used to develop a better understanding of the demographics and needs of the homeless population, and to secure funding that would help them secure permanent housing and support services. “It’s the human spirit inside of us that says, ‘Let’s help our brothers and sisters out,'” said Supervisor Hilda Solis, who also volunteered for the Count along with Los Angeles Mayor Eric Garcetti and Councilman Marqueece Harris-Dawson. Last year’s Count estimated the homeless population countywide at 41,174 – a 12 percent increase from 2013. Skid Row alone accounts for almost 4,000, and 2,500 of them live within the boundaries of the Second District. 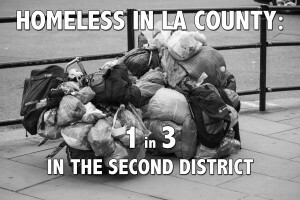 Altogether, one in three homeless persons throughout Los Angeles County can be found in the Second District. Last summer, the Board of Supervisors approved a motion by Supervisors Ridley-Thomas and Solis to fund and create four outreach teams just for Skid Row. Composed of County health professionals, LAHSA outreach workers and formerly homeless persons, the teams try to connect the homeless to County-funded medical, mental health and substance use services and supportive housing. The County is also funding rapid rehousing subsidies and services for homeless persons who can be connected to employment or other sources of income and become stable after a shorter period of assistance. 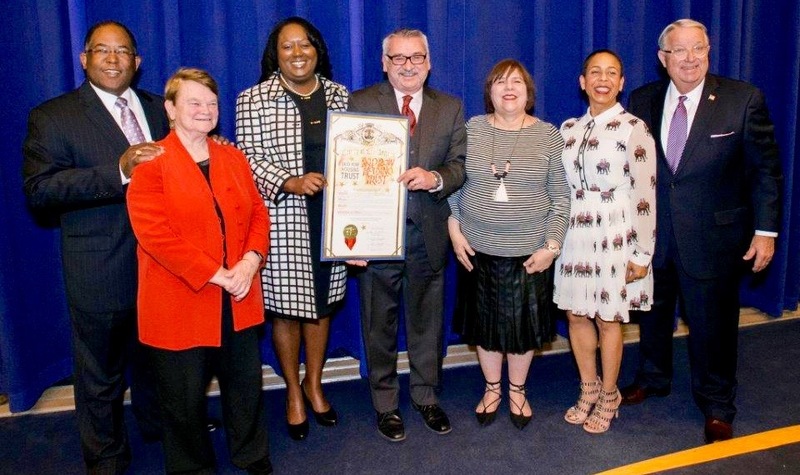 Supervisor Ridley-Thomas’ office has also dedicated funds for homeless women on Skid Row, to ensure they are taken off the streets and out of harm’s way as quickly as possible, and into stable housing. The County is in the midst of preparing a comprehensive plan for addressing the crisis of homelessness, and recently held public hearings to solicit community input. Supervisor Mark Ridley-Thomas awarded a scroll recognizing an honor bestowed upon the Skid Row Housing Trust, whose Star Apartments project made it to TIME Magazine’s list of the 25 Best Inventions of 2015. TIME Magazine noted that most housing projects for the homeless tend to look like warehouses but that’s not the case with Star Apartments, designed by architect Michael Maltzan. Completed in 2014 along a border of Skid Row, it features 102 prefabricated studios ingeniously stacked atop a medical clinic on the ground floor, as well as a Health and Wellness Center with a garden and outdoor running track on the second floor. 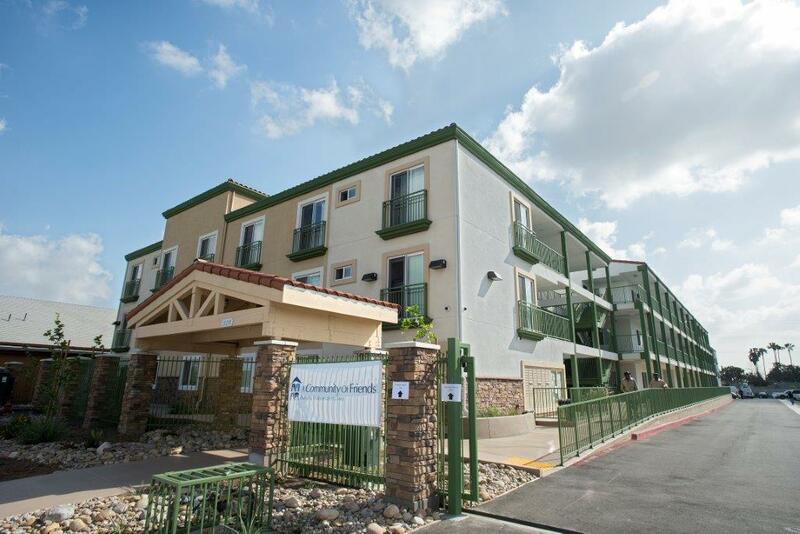 A nonprofit organization, the Trust is one of the largest providers of permanent supportive housing in Southern California, maintaining more than 1,800 units at 26 locations. It built Star Apartments with support from the public and private sectors, including $400,000 in funding from the Office of Supervisor Ridley-Thomas. 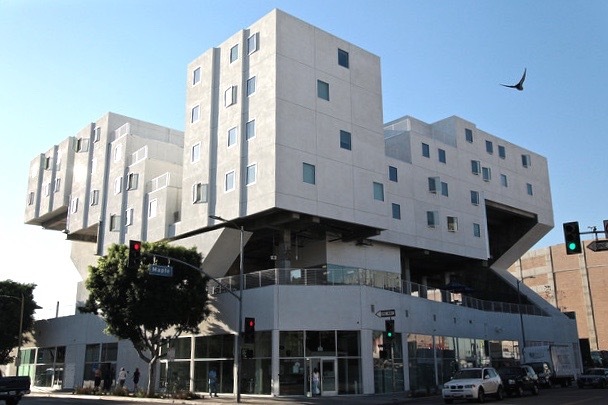 Star Apartments serves as the headquarters of the Los Angeles County Department of Health Services’ Housing for Health program, which identifies frequent users of the public health system and puts them in permanent supportive housing. By putting a roof over their heads, and providing them with much-needed medical and psychiatric care, the program helps people avoid multiple costly trips to the E.R. and enables them to attain greater levels of stability, independence and economic security. 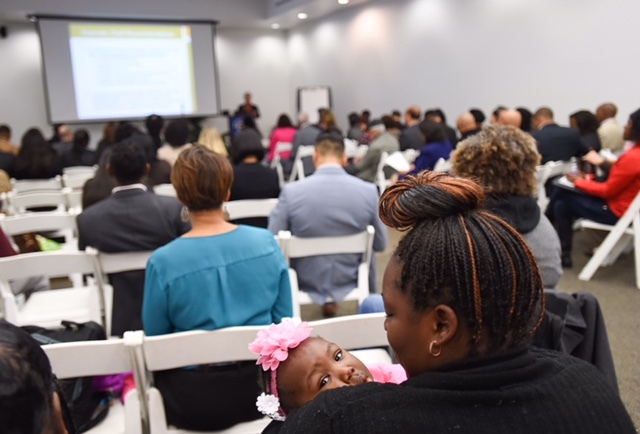 Just prior to the deadline to provide feedback for Los Angeles County’s Homeless Initiative, nearly 100 community members and homeless experts attended a meeting at Exposition Park to learn more and offer feedback on strategies to prevent homelessness in the Second District of Los Angeles County. 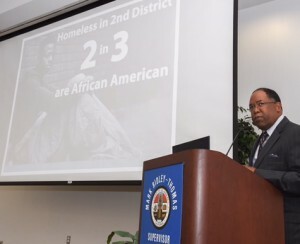 “Our community can be no stronger than its most vulnerable residents,” said Los Angeles County Second District Supervisor Mark Ridley-Thomas. More than 44,000 people are homeless in Los Angeles County. 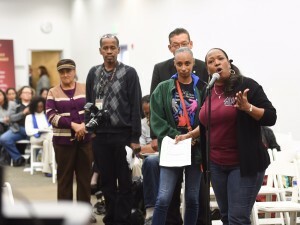 The second district has the highest proportion with about one out of every three homeless persons living in the Second Supervisorial District—over 14,000 men, women and children. “We cannot do this alone. It will take a collective effort of government agencies, elected officials, faith leaders, academic leaders, community based organizations and concerned individuals,” the Supervisor said. Los Angeles County has provided more than 40 draft strategies to combat growing homelessness across the region. The recommendations represent the most comprehensive effort ever undertaken by the county to attack the root causes of homelessness and lift thousands of people off the street. “This is a historic opportunity homelessness throughout LA County,” said Phil Ansell, Director of the Homeless Initiative for Los Angeles County. The Los Angeles County Homeless Initiative was launched on August 17, 2015 to generate coordinated strategies to reduce homelessness through an intensive, inclusive planning process. In February 2016, the process will culminate in consideration by the Board of Supervisors. Avalon Apartments, a project funded through the Mental Health Services Act and developed by A Community of Friends. It has 37 affordable housing units for families. Looking for new ways to address Los Angeles County’s crisis of homelessness, the Board of Supervisors called for an analysis of proposed state initiative that seeks to invest $2 billion to build permanent supportive housing for the chronically homeless who are living with mental illness. On January 4, California Senate President Pro Tempore Kevin de Leon and a group of state senators announced they would pursue a legislative package dubbed “No Place Like Home.” Its key provision would repurpose Proposition 63 or Mental Health Services Act (MHSA) funding, leveraged with other local, state and federal funds, to secure construction bonds. The County Department of Mental Health (DMH) already collaborates with the California Housing and Finance Agency to creatively utilize MHSA money, leveraging with federal, state, local and private funds. So far, these efforts have created more than 900 permanent supportive housing units for homeless persons living with mental illness, with another 175 units expected in the next two years. 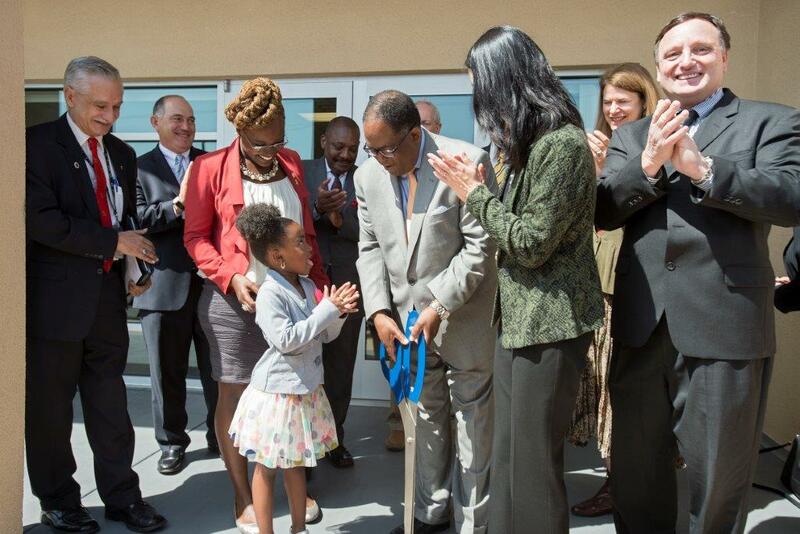 Supervisor Mark Ridley-Thomas greeting one of Avalon Apartments’ youngest tenants during the ribbon cutting ceremony in April 2015.